Sarah Murnaghan, the 10-year-old Philadelphia girl who fought a legal battle to be included on the adult lung transplant list, has developed pneumonia in her right lung. Sarah's mother, Janet Ruddock Murnaghan, wrote on her Facebook Monday that the disorder was caused by fluid from her stomach that entered her new lungs. "Yesterday was tough. Today she is more stable, but this is definitely a large set back," she said, thanking fans for their support. The transplanted lungs, the second double lung donation that Sarah underwent in a month, had been infected with pneumonia when she received them. It is unclear if her new illness was a lingering result of getting diseased organs. Aspiration pneumonia occurs when fluid from the stomach comes up from the esophagus and into the lungs. CBS News chief medical correspondent Dr. Jon LaPook explained that because of the position of the major bronchi (large breathing passageways that bring air into the lung), stomach fluid typically goes into the right lung. "Rather than being an immediate infection, this is more of a chemical burn because stomach fluid is usually full of acid and sometimes bile," he explained. The illness can be treated with antibiotics -- to prevent secondary infections -- and supportive therapy, which includes monitoring the patient's oxygen level, fluid status and blood chemistries. Sarah's fight to survive has come with controversy. 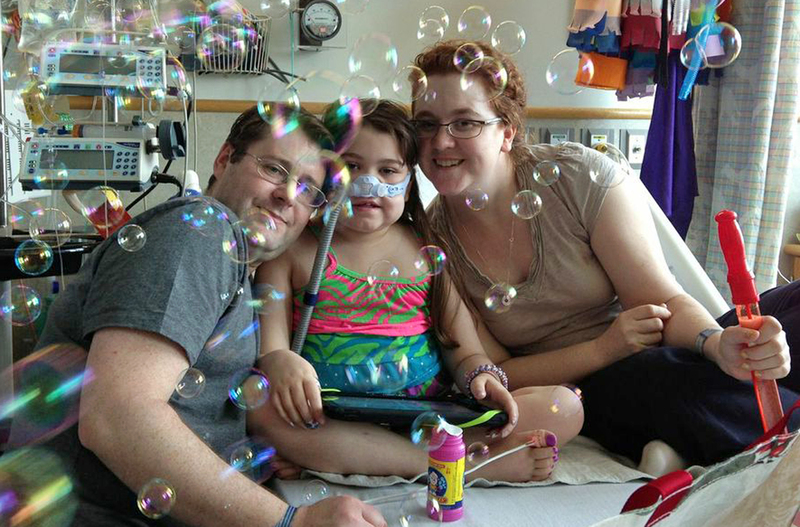 The young girl, who has end-stage cystic fibrosis, needed a double-lung transplant. While her condition placed her at the top of the pediatric donor list, her young age put her at the back of the adult transplant list. Adult organs are only allocated by severity of illness for those ages 12 and up. This meant that Sarah would only be eligible if everyone with her blood type older than 12, even those less sick than her, passed on the lungs. Pediatric lung transplants are extremely rare. There were 10 lung transplants completed on children 10 and under last year, according to Health Resources and Services Administration. That same year, there were 1,744 lung transplants on people 11 and older. Sarah's parents started a Change.org petitionto get added to the adult list, and then sued in a Philadelphia court. A judge ruled that Sarah and another 11-year-old boy with end-stage cystic fibrosis should be added to the adult lung transplant list. The Organ Procurement and Transplantation Network also added a special review process for children who are in desperate need for organs. The medical communityhas been divided over whether or not younger children should receive adult organs. Because lung transplants have a 50 percent chance of failing within five years -- regardless of the recipient's age -- some doctors argue that the lungs should be given to the person with the best chance of success. Adult lung transplants in pediatric patients have not been well-studied, and patients with additional health problems like Sarah may even be at a lower chance of success. Sarah receivedher first adult double-lung transplant on June 12. Her mother said that she suffered a primary graft failure (PGF) because of the poor quality of the lungs, causing the lungs to deteriorate quickly. Because of her dire need, she was put on the adult organ transplant list again and received a second pair of lungs infected with pneumonia on June 15. She had another procedure on July 1 to repair her diaphragm, which had become paralyzed because of the procedures. Though there is a cure for her pneumonia, Dr. Arthur Caplan, a bioethicist at New York University Langone Medical Center, pointed out to CBSNews.com that the success rate for lung transplants drops sharply on re-transplantation, especially when there is a rapid failure of the organ. The immunosuppressant drugs taken during transplant surgery also take a toll on the body, and the fact that Sarah's first lungs did not work may not bode well for her prognosis, he said. Caplan, who was not involved in Sarah's case, believes that there is a possibility that the doctors transplanted poor quality lungs because they were hoping for a second, better organ, which is known as a "bridge to transplant." Still, the procedure is very risky and very experimental, considering her age. "The second set of organs weren't in great shape... It's not clear they would have tried them in anyone else anyway, but they probably were willing to push the envelope," he explained. Caplan argued the bigger issue is not whether two sets of organs that could have helped others were given to Sarah, but whether all the treatments that she is going through is causing undue and unnecessary pain and suffering on her. It's hard for parents to accept that a child may be terminal, and doctors have an obligation to try everything for their patients. "Bottom line: Did she likely take organs from others? Most likely no. The ones she got are likely to be marginal and she is not living at someone else's expense. But now has she been put through some really experimental efforts, because we don't know much about pediatric lung transplants and chopping lungs to a smaller size," he said.